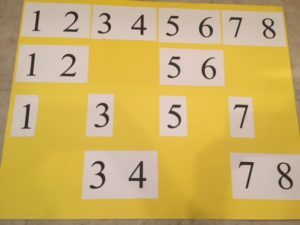 Can you tap or clap on the beat where there are numbers? Point to the poster. Tell the children: Tap with two fingers on the palm of your other hand on each number or clap. When a number is missing, don’t tap or clap. Now we are going to sing the song WHILE we follow the numbers and clap (or don’t clap)! You can use this activity for songs like Nephi’s Courage (120), The Fourth, Fifth, Sixth, Ninth, Tenth, and Eleventh Article of Faith (124-130), Choose the Right (Hymn 239), or Follow the Prophet (110). This works for any song with a 4/4 time that has a strong beat. This will work for songs in 3/4 time like Stand for the Right (159), Seek the Lord Early (108), We’ll Bring the World His Truth (172-173), The Seventh and Twelfth Article of Faith (126,131), or The Books in the Old Testament (114). You can even use it for some songs in 6/8 time like Dare to Do Right (158) and I Lived in Heaven (4). Again, the song has to have a fairly strong beat to use this fun activity. This is challenging to the children (and sometimes the adults<grin>), and the focus on the steady beat is a great thing for them to focus in, feel the strength of the beat of the song, and allow the words to come in the backdoor even more deeply into the memory without even being aware of it. And it is fun! On the 4/4 poster, is each number an eighth note or a quarter note? Dear Leila, Each number on the 4/4 poster is one beat (on quarter note). (Although for the 3/4 poster, if used for a 6/8 song, it is different!) Thanks for noticing. Thanks for asking! Will you post a video doing this? Yes, I will try. This week is a little hectic because I am traveling to Portland for a workshop in two days, but perhaps next week I can get it up. Thanks for asking! Do you repeat the pattern on the poster for however long the song is or do you make extra patterns to match the length of the song? 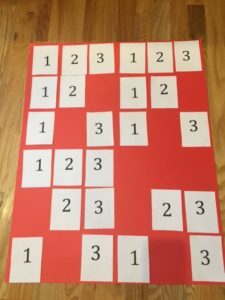 Fyi I use your activities all the time in primary and have been trying to create more similar ones based on your old posts for the songs we are learning. Your website has been a lifesaver for me. Thank you. Dear Becky, Thank you, thank you for trying to create activities for your children from the old posts. That is so much what I’m hoping for! Yes, you just keep repeating the pattern on the poster to match the length of the song. Thanks for asking! I LOVED your video workshop and I love, love, love this website! Thanks so much for putting it all online! This is probably a silly question… but I noticed you taught or worked on about 3 songs per Sunday (in your video workshop). Is it okay to start songs early like “Stand for the Right” is the song in March, do I need to wait until March to start working on it? Or do you just work on all the songs all year? That’s a great question. I work on I’m Trying to Be Like Jesus (one of the songs this summer) right now as well as Stand for the Right and the others. I do try to do a song for three weeks in a row once I’ve started it, then review it once every 6 weeks with another activity once they’ve learned it. It is good for their memory and their experience to come back to something they know in a new way (the new activity). I would say “yes,” start on Stand for the Right as one of your three songs. Thanks for asking! Yay! This makes me so excited! I am so very thankful I came across this blog. You have already helped me soooo much! Thanks again! So what does your planning book look like? Are these two posters set up for certain songs or did you remove the numbers arbitrarily? I’m not sure if the rests are supposed to help drive home certain words or not. Does that make sense? Great questions Dantzel! I go through the pattern once with them, then have them start again and I start singing. The piano could play, also, but I want them to hear the words as they are concentrating on the beat scramble. Their focus and involvement lets the words slip in the back door. This is a generic poster that can go with any 4/4 song that has a strong beat. The 3/4 poster can go with a 3/4 song. I think you could make a poster that drives home certain words, but this particular one is generic. Thanks for asking! Also, do you begin by singing it while they tap, or have the piano play without anyone singing words while you tap? Any guess of what size font you used? I can figure it out by trial and error… but if you remember that would save me some time. Sharla, I can’t thank you enough for the time you take (and your family) for sharing and teaching me. Our ward is focusing on the Articles of Faith and our senior primary is on the 12th one. I could use your steady beat review later in the month, this is not a long article of faith, but could you share some other fun rhythm patterns for me to use. I am praying that these methods will help me, too. I have faith, but maybe they’re 55 years too late. I love your book, and maybe there’s hope, I’ve only been serving here for two months. Again, thank you. Some ideas for the 12th Article of Faith might be: Body Rhythm Pattern – Patsch, Clap, Snap, Rhythm Sticks – Click, click, patsch then doing an extender of finding a partner and doing click, click, click with your neighbor, Paper plates – tap, tap, tap in a rainbow shape above your head, then patsch, patsch, patsch, Paper Cups – hit on one leg of your lap, bring it up and hit with your other hand, switch hands, then hit on the other leg, bring it up and hit with the opposite hand, switch hands. If you did one of these each Sunday just for 4 or 5 minutes, the children will get a strong sense of the beat and feel of this Article of Faith, and the words would slip in the back door! Do you ever just sing the song to review? How are you sure they know the words otherwise? Do you ever teach dynamics while singing? I’m new to this calling and these teaching methods. Could you do this in a combined primary? Or would it be too challenging for the younger kids? I only do this with the older children. The 7 year olds could probably do it, but none of the other younger primary could do it very well.